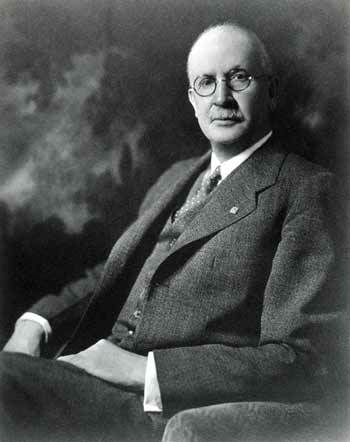 April 12, 1958: Death of Edward Bartow.“Edward Bartow (1870–1958) was an American chemist and an expert in the field of sanitary chemistry. His career extended from 1897 to 1958 and he is best known for his work in drinking water purification and wastewater treatment. He was well known as an educator, and his many students went on to leadership positions in the fields of sanitary chemistry and engineering…. He began his career as an instructor of chemistry at Williams College about 1896. His first academic appointment was as an assistant professor of chemistry at the University of Kansas. He taught there from 1897 to 1905. While in Kansas, he worked with the U.S. Geological Survey analyzing the waters of southeastern part of the state. His next position was as Director of the Illinois State Water Survey. He also held the title of professor of sanitary chemistry at the University of Illinois from 1905 to 1920. He led efforts to eliminate typhoid fever by developing treatment methodologies for water purification. In 1914, he began the first large-scale investigations of the new sewage treatment process called activated sludge. A bronze plaque was placed on the grounds of the Champaign-Urbana Sanitary District to commemorate the work on this process done by Bartow and his colleagues. The Illinois State Water Survey became well known for producing high quality work and the fourteen volumes of bulletins and reports published during his tenure are classics in the field of sanitary chemistry and engineering. From 1920 until his retirement in 1940, he was professor of chemistry at the University of Iowa. He significantly enhanced the department and when he left, the number of PhD degrees awarded totaled 240 in chemistry and chemical engineering…. Commentary: This posting is from another one of the biographies of inductees into the Water Industry Hall of Fame that I wrote for Wikipedia. This entry was posted in Year 7 TDIWH and tagged activated sludge, AWWA, drinking water, Edward Bartow, Illinois State Water Survey, public health, sanitary chemistry, USGS, water, water history, Water Industry Hall of Fame on April 12, 2019 by safedrinkingwaterdotcom. 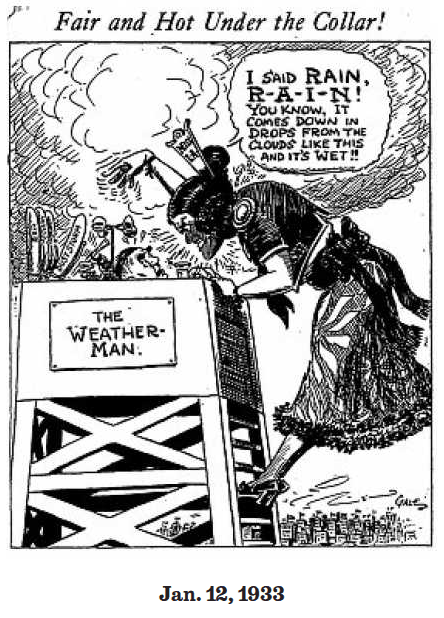 January 12, 1933: Drought Cartoon. The Los Angeles Times has published cartoons over more than 100 years that depict the many droughts that California has suffered and the reactions to them. Here is one that I think you will enjoy. Cryptosporidium oocysts on an intestinal cell surface, S.E.M. Commentary: This outbreak caused a lot of concern in the drinking water community, but it was the epidemic of cryptosporidiosis in Milwaukee in April six years later that drove the second phase of the enhanced surface water treatment rule. Reference: Hayes, E.B. et al. 1989. “Large community outbreak of cryptosporidiosis due to contamination of a filtered public water supply.” N. Engl J Med. 320:21(May 25): 1372-6. January 12, 1870: Edward Bartow was born.“Edward Bartow (1870–1958) was an American chemist and an expert in the field of sanitary chemistry. His career extended from 1897 to 1958 and he is best known for his work in drinking water purification and wastewater treatment. He was well known as an educator, and his many students went on to leadership positions in the fields of sanitary chemistry and engineering…. This entry was posted in Year 7 TDIWH and tagged activated sludge, AWWA, cryptosporidiosis, Cryptosporidium, disease outbreak, drinking water, Edward Bartow, Georgia, Illinois State Water Survey, oocysts, public health, sanitary chemistry, USGS, water, water history, Water Industry Hall of Fame, water treatment on January 12, 2019 by safedrinkingwaterdotcom. April 12, 1958: Death of Edward Bartow. “Edward Bartow (1870–1958) was an American chemist and an expert in the field of sanitary chemistry. His career extended from 1897 to 1958 and he is best known for his work in drinking water purification and wastewater treatment. He was well known as an educator, and his many students went on to leadership positions in the fields of sanitary chemistry and engineering…. This entry was posted in Year 6 TDIWH and tagged activated sludge, AWWA, drinking water, Edward Bartow, Illinois State Water Survey, public health, sanitary chemistry, USGS, water, water history, Water Industry Hall of Fame on April 12, 2018 by safedrinkingwaterdotcom. January 12, 1870: Edward Bartow was born. “Edward Bartow (1870–1958) was an American chemist and an expert in the field of sanitary chemistry. His career extended from 1897 to 1958 and he is best known for his work in drinking water purification and wastewater treatment. He was well known as an educator, and his many students went on to leadership positions in the fields of sanitary chemistry and engineering…. This entry was posted in Year 6 TDIWH and tagged activated sludge, AWWA, cryptosporidiosis, Cryptosporidium, disease outbreak, drinking water, Edward Bartow, Georgia, Illinois State Water Survey, oocysts, public health, sanitary chemistry, USGS, water, water history, Water Industry Hall of Fame, water treatment on January 12, 2018 by safedrinkingwaterdotcom. This entry was posted in Year 5 TDIWH and tagged activated sludge, AWWA, drinking water, Edward Bartow, Illinois State Water Survey, public health, sanitary chemistry, USGS, water, water history, Water Industry Hall of Fame on April 12, 2017 by safedrinkingwaterdotcom. Reference: Hayes, E.B. et al. 1989. “Large community outbreak of cryptosporidiosis due to contamination of a filtered public water supply.” N. Engl J Med. 320:21(May 25): 1372-6. January 12, 1870: Edward Bartow was born. “Edward Bartow (1870–1958) was an American chemist and an expert in the field of sanitary chemistry. His career extended from 1897 to 1958 and he is best known for his work in drinking water purification and wastewater treatment. He was well known as an educator, and his many students went on to leadership positions in the fields of sanitary chemistry and engineering…. This entry was posted in Year 5 TDIWH and tagged activated sludge, AWWA, cryptosporidiosis, Cryptosporidium, disease outbreak, drinking water, Edward Bartow, Georgia, Illinois State Water Survey, oocysts, public health, sanitary chemistry, USGS, water, water history, Water Industry Hall of Fame, water treatment on January 12, 2017 by safedrinkingwaterdotcom. This entry was posted in Year 4 TDIWH and tagged activated sludge, AWWA, drinking water, Edward Bartow, Illinois State Water Survey, public health, sanitary chemistry, USGS, water, water history, Water Industry Hall of Fame on April 12, 2016 by safedrinkingwaterdotcom.